Dimensions: 14.5"h x 19"w x 4"d. 600 Denier Poly with contrast colors. This Zipper Top, multi-purpose tote is perfect for work, travel, leisure and especially PICKLEBALL! 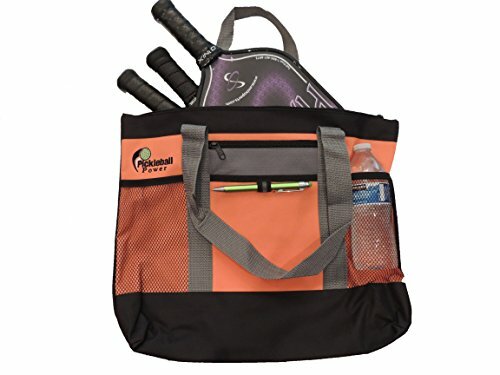 Features a secure zipper top with a large main compartment which will easily hold at least THREE Pickleball paddles as well as balls, clothes, and numerous personal items. It also has TWO side mesh pockets that are perfect for water bottles. Large front pocket with additional zipperd pocket above. Wide comfortable shoulder straps in grey and pen loop in front. Also black and grey accents on front. Back of tote is solid black. Multi-colored Logo: Long-lasting professionally EMBROIDERED with the "Pickleball Power" logo. If you have any questions about this product by Pickleball Marketplace, contact us by completing and submitting the form below. If you are looking for a specif part number, please include it with your message.